is paris always a good idea? : the great pumpkin. The air is crisp, the sun is still warm, and leaves turning all shades of lovely; fall is officially here! PSLs for everyone! (PSL, you know, pumpkin spiced lattes.) With my vibrant fall spirit freshly awakened, I thought a fun American activity to introduce to my French teen-agers was to carve a pumpkin. As usual for Wednesdays, I met them at our corner in the 11th, but before heading to their house I told them we were taking a bit of a detour. Already, they were skeptical and protested that we weren't going to the right way. I've learned now to ignore them when they tell me how things are done, and with a smile and an "Allez, guys" I led them down the street towards the florist. The florist had a lovely display set up out on the sidewalk of autumn bouquets, cabbage flowers in violet, snowy whites, and pale greens, and one last pumpkin; so plump and so perfect, just begging to be purchased by my little American hands. The six of us walked into the empty shop looking for signs of the clerk, but there weren't any. Even after several "bonjours" and "y a quelqu'un? ", we still hadn't made any progress. Like a typical scene in any horror film, there was basement door and it was open with a dim light illuminating the spiral stairs, luring one of us to go "check it out". Not wanting someone else to swoop in and grab my dream pumpkin, I went outside to pick it up with the intentions of coming back in to wait at the cash register. With my back was turned, reaching for the pumpkin, the kids who were still in the shop began screaming, howling in fact. For a moment there, I thought Leatherface himself had made an autumn trip to Paris and had bursted out of the creepy basement with his raging chainsaw, ready to attack. What was going on? I quickly turned around, with pumpkin in hand, and screamed, "What, what, what, quoi?" "You can't just pick up the pumpkin like that!" they shouted in scattered cacophony. "Because, you must wait for the owner of the shop to do it! Put it down at once!" Relieved that they weren't about to be slaughtered (or was I? ), I sighed, looked down at the pumpkin and was almost about to follow their wishes but decided better and questioned them. "But wait, why not?" I asked. "Because that's just not how it's done." In a stand off, we faced each other. Little me holding the pumpkin and five French teen-agers who were beyond horrified that I would help myself in such a brazen manner. It hadn't even occurred to me, but they were right, that isn't how it's "done" here. Business, especially in small shops like this one, is conducted much more passively. Sometimes it's hard to break out of your customs especially around the holidays. Growing up, my family and I have always picked out our pumpkins and brought it to the cash register. Never would we ask the cashier at Red Apple (which is now Gristede's) on 7th Avenue to go out and select it for us. I almost heeded to their demands but thought this was a great opportunity to share the idea of different cultures and customs, which is the point of why I am even with them. Before I could launch into what was surely going to be a boring lecture about cultural differences, the florist who was eating a roasted chicken at the take-out shop just next door came rushing over in reaction to the hysteria. I explained that we were interested in purchasing the pumpkin, which then was interrupted by an orchestra of the guys all "accusing" me of wanting to purchase it, and asked if it was okay to help myself and bring it to the register. The florist, bless him, didn't see a problem with me holding the pumpkin and could see that my hands were full, literally an figuratively, made somewhat of a show to appreciate my help. "Ca va les garçons, she is helping an old man like myself," he said, chuckling at their humorless dispositions. "Follow me and I'll ring you up, dear." Beyond grateful that he didn't challenge me either because I would never have heard the end of it from these mutants, I gave him smile of relief. Merci, monsieur. Their reaction did get me thinking though: if a French person in the States asked the cashier to go select their pumpkin (or whatever) from the stand, we would find it rude. And here, thinking we are helping by bringing our selections to the register in some shops would be considered obnoxious and pushy. It's interesting. Without further ado, here he is! 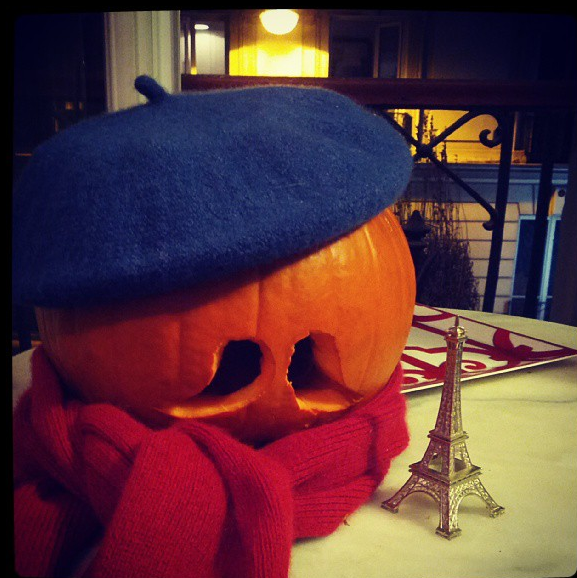 The return of Jacques O' Lantern, the French pumpkin! Up revealing the French pumpkin to my teens, they stood in silence, just glaring at poor Jacques. With their heads tilted fashioning expressions of pure distaste, they stared at him, then to each other before one turned to me and asked, "So what makes him French?" Your pumpkin is super cute! My French husband fully embraced the whole pumpkin carving thing when he was in the US, but we haven't done it since we moved here. Maybe I will surprise him with a pumpkin when he gets home tonight. Thanks Emily! I love him. He's basking by the window right now, getting in a little sun that is peeking through the clouds. Sa vie est dure, eh? I hope you picked up that pumpkin for le hubby! It really is such a fun tradition that I don't think we're ever to old for. viva la differance mon amie. Aww, I'm glad you like him. He's been a nice addition to the living room that is getting more autumn-y by the day! Seriously, can you imagine the look on the grocer's face if someone was all, "I'll take that one please." It just wouldn't work! It's these differences that keep Paris still so fresh for me, even after four years. I love them! Have a nice weekend, Deb! Yes! 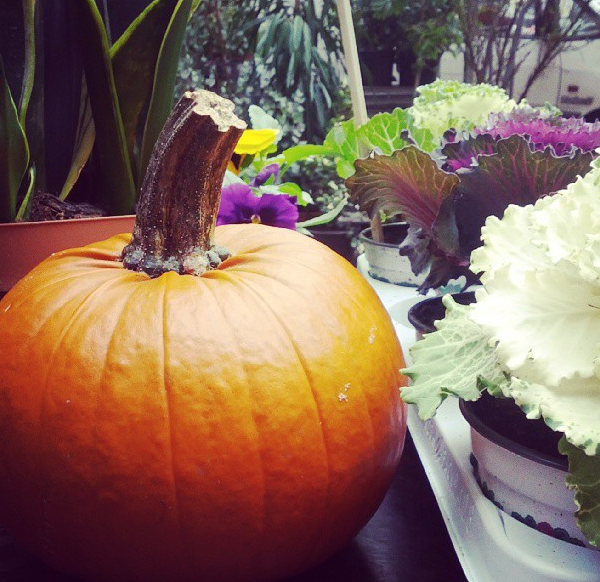 I love a good pumpkin-in-another-country story! Here as we'll you're considered a jerk if you handle the produce yourself. Culture, I tell ya! I had to walk home with Jacques and got quite a few looks! The Jack-o-lantern thing has quite swept the nation here. You know, I had a feeling this wasn't just limited to France. Thanks for confirming that Italy has this no-hands policy either when it comes to the precious produce! I am loving your blog! You have such a gift for writing. This post was hilarious! How are you? Thanks for stopping by! I'm glad you enjoyed my teenage mutant frenchie story. I have quite a handful of them! I've never imagined a cultural difference like that! Did you ask the teens if they would ask someone to pick it out for them in America? I know! It was so strange. I didn't think twice about picking it up myself. But here apparently, it's deemed extremely pushy. Who knew? I was at Times Square in Seoul last night & thought of your cultural clashing shopping experience. I've experienced this before, but kinda forgot about it. I went into a few beauty shops & they were on me immediately, standing inches away, turned toward me and either staring at me or staring vaguely into space. I'm pretty sure this is a cultural thing, acceptable in Korea, but when it happens I get the heebie jeebies and just walk out. Not that I think it's a bad cultural practice, I just can't handle not having my space most of the time. It makes my skin crawl. Merci ma belle! The looks on their faces during Jacques grand reveal...priceless. These kids think I am insane. Fantastic. Jacques O' Lantern is amazing. So happy to have found your blog, such a funny take on life abroad. Thank you so much! I try to keep the humor in this crazy French life even though most of the time the joke is on me. Thank you for reading. I'm glad that you are enjoying the blog! "So what makes him French?" I know. It was pretty classic. And the kid who said it has a bit of a raspy voice. Perfect delivery. I love it -- such a cute Jacques! Interesting cultural encounter, as well. As always, thanks for writing. Thank you for your comment! Welcome! I'm glad you like Jacques. He's been a bit fussy lately, this year he wants wardrobe changes. Quel diva! Thank you again for commenting and for stopping by! Funnily enough I was away last weekend in the Alps with a bunch of women, a mixture of Brits and Americans, who mostly live in Switzerland. We were trying to explain to one lady, very recently arrived from the US, why Americans can freak the Europeans out entirely by their bold ways. Mind you, the one American who was over visiting a friend and had come along to this retreat, was freaking even her out with her grilling of the entire party about how we came to be there! Oh yes, more charming. Those little angels. Wow, good for you for being able to pick out your own produce! I don't think my primeur would ever get used to that! Hahaha, does she really shuffle? Picturing it now. Thanks for the image. You will! I think he has another day or so before he's a goner! French pumpkins don't last as long as American ones. Jacques is brilliant! I chuckled at "What makes him french" - your boys are quite charming.. can't wait to hear more of your teaching adventures! Thanks! He's really made the house quite festive! Oh yeah, the kids did not get the whole beret/mustache thing as being "French" like how we do in the States. It was actually really interesting. How are you doing? Long time, my dear! Must hop over to your blog to see what you've been up to. Hope all is well! I too love that line: "So what makes him French?" I'm not sure I'd like someone else picking out my produce. I'm so very picky about mine! I think this comes from having grown up on a farm. I fully inspect all my produce before buying. But, you know, I grew up selling produce from a food truck of sorts to other Americans in much the same way that the French do. We picked it out for the customers, so I guess I get it. It was pretty funny. I got a good laugh out of that myself! Leave it to kids, eh? We have something in common. : ) While I didn't grow up on a farm, my family sold produce at a produce stand in NYC which then later became a little market. We're produce gals, so yeah, we like to pick our own damn veggies! Wow Ella. We are produce gals! I think that growing up working with the public is something that is rather special. I didn't like it at the time, but now I know what great insights it gave me. For example, some people don't know the difference between a cucumber and a zucchini. Other people think that bananas are grown in America. And some people feed hot peppers to their birds. Omg, if you can pull that off, PLEASE post it on IG! My favorite part was their confusion about what made him French. Hahahah! In Spain, it's different than the US and France. At my local frutería (fruit and vegetable shop), most things you can pick out yourself—WITH a glove on!—and they'll weigh it for you. However, certain things you have to ask for. These are usually more-seasonal things. For example: pomegranates, fancy mushrooms, figs, strawberries, plums, green beans (? ), and on and on. I can always pick out my tomatoes, potatoes, onions, apples, bananas, etc. At the supermarket, it's different. You can pick out most anything yourself and then you weigh it and it prints out the price tag. I suppose it's for speed; that way the cashier doesn't have to enter the Spanish equivalent of the PLU code, thus speeding up the transaction. But #1 rule: ALWAYS, ALWAYS wear a glove.